This has been a very crazy long weekend. I got home late last night and crashed right away, slept about 12 hours - my body was exhausted! Friday I had an interview for an administrative position at a prestigious private high school here in the city, and it went amazingly well - before the interview was even over, I was offered a second interview in early August! Though it is not a teaching position, it would still require me to speak French a majority of the time; the interviewer, a native speaker, said my French was excellent, and that made me feel incredible. My one weakness with this position is that it is a secondary school, meaning I'd be working with middle and high school students, but my experiences so far (as a lecturer and as a Resident Assistant in college) have all been with university-age students. Since I have about two weeks until the follow-up interview, I plan on visiting the library often - I've already reserved several books on adolescent psychology to start reading and taking copious notes. 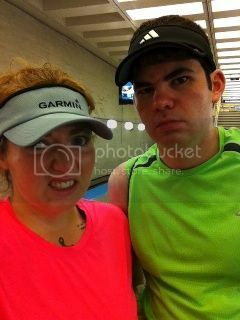 After the interview, I met Matt on the train to head to McCormick Place for the Rock 'n' Roll Chicago half marathon packet pick-up. 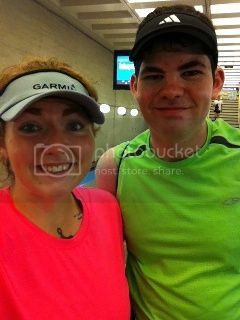 We got our shirts and bibs, then explored the expo a bit. He bought new patellar straps at the Pro-Tec Athletics booth while I entered into their raffle - and I won! A signed copy of Scott Jurek's "Eat and Run," which I am excited to read. He's a vegan athlete who won the Badwater ultramarathon ... twice! I can't imagine even finishing it, let alone finishing first. Saturday morning, we got up bright and early and drove out to the suburbs to volunteer at a 10 mile trail race. There were more runners than I expected, though still a small race compared to some you see in the city proper. We worked as course marshals, first at a beginning point where they have to cross a street and then at the final turn from the woods onto a path to the finish. It was a very disorganized race, and a few of the racers were complaining about it, even as they ran past us. One guy even started cursing at Matt, which was frustrating - we're volunteers, not race directors! Our final task was to hand out medals to little kids after a 100 meter dash, and that was fun. Afterwards, we went out for lunch/dinner to enjoy some carbs before our race the next morning. We went to a make-your-own-stirfry place called Flat Top Grill - delicious, but definitely something we can very easily make at home. I'm trying to be more conscious of money and budgeting, and cutting down on meals out will help with that. We're doing much better than we did last summer, though there's still room for improvement. I read a few tips on Pinterest before grocery shopping later that night, and ended up saving $40 on a $70 grocery bill! Our recent favorite go-to sweet treat is frozen blueberries, and one local store was having an amazing deal on both the berries and boneless skinless chicken breast, so I stocked up and loaded up the fridge and freezer with those, as well as other fruits and veggies, Greek yogurt, and a few other things we keep around the house. We were very nervous ahead of time - thanks to our sunburns, we were both pretty undertrained, plus the weather was going to be humid and quite hot. Very different compared to my first half in Los Angeles in January, where I wore a long-sleeve top! I went for a run in the middle of last week, and my legs felt fine, though my back was still a bit raw from sunburn recovery. I knew this wouldn't be a race PR by any means, I just wanted to finish in one piece! We started out strong, with 11 minute miles or so for the first 3-4 miles. We walked through water stops, and took ice/walked through hoses at the cooling stations. 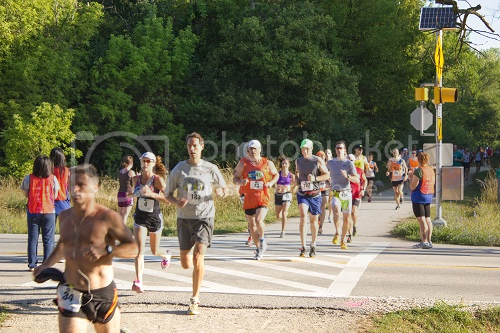 I was a bit sluggish at first but caught my second wind around mile 8, after taking my second Clif Shot. That was about the time his knees starting really bothering him, though, so we alternated walking and running for most of the last four miles, then ran all of the last 1.1 miles. Even though we walked during the race, we never stopped, which we're proud of. We drank at every water/Gatorade station, got sprayed a few times, and I took a bit of Vaseline at one point to alleviate the chafing I could feel was starting around mile 6. And I was thrilled to meet both goals. Holding hands, we ran across the finish at 2:53:06. I can't wait to see the official photos! Hopefully they look okay - no matter how much I enjoy a race, no matter how big I smile, the cameras always seem to catch me with the most awkward face! After the race, we went to lunch with a few of his friends who came out to support him (and one who ran also! 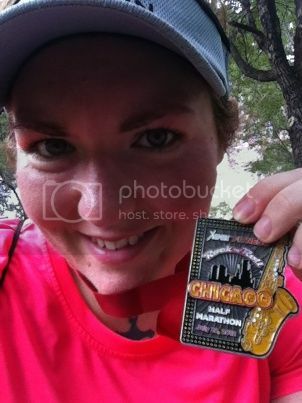 ), then went home to clean up and rest before heading to a rooftop BBQ party with a ton of folks who ran (many of whom will also be running the Chicago Marathon) - my love Claire, and lots of healthy folks who blog on Tumblr. It was such a wonderful night - good view, great food, amazing company. It absolutely felt like home to me - being social with people with common interests after my ten months in California was absolute perfection. When someone asks you how it's going, you reply "Forward!" Brilliant. And then he shouted How's it going? and the crowd echoed his perfect response. I loved it. It reminded me of my healthy living mantra, that "all forward motion counts." In that moment, it was just what I needed to hear. I learned a lot from this race experience - namely, I have a lot of work to do with getting back into the habit of running here. The heat and humidity were very tough to deal with - we saw a few of the timing pacers walking, even! Hopefully they won't be so oppressive at my next half (I am registered for one in September with my friend Lorelei, it will be her first!). For that one, I definitely need to make sure I am well trained (should be better next time, as it is about a month before the full marathon, so my training will be up to about 18-20 miles at that point). And I definitely need to stay focused with eating well and avoiding binges - even though I weighed about 2-3 pounds less than I did at my half in January, all my training runs up to this point have been while I was 5-10 pounds lighter. It certainly contributed to my initial sluggishness - I felt so awful at the first point when I could feel myself slowing. Matt asked if I was okay, and I replied I'm carrying 20 more pounds than you. I felt guilty for slowing him down, even though he said it was fine, that his knees couldn't go much faster anyway. I feel big and bloated and all-around yucky, and the way running the race felt is definitely inspiring me to stay more focused on my long-term goals than my short-term cravings. What about you? How was your weekend? Any races or events? Anyone who works with teens (or has some of their own!) - any advice for reading materials? I think picking up the books is a good idea. Teenagers are extremely complex. I did take an Adolescent Psych class as part of my education major, and it was fascinating. I've been really lazy about exercise lately (damn heat and feet), but I've been trying to eat better. I just made some baked chicken breasts with brown rice and peas and carrots. My boyfriend promptly dumped sugar all over his rice (it's his favorite way to eat it). I facepalmed. Literally. Oh, and I meant to say - you and Matt look absolutely adorable in both pictures. I love the bright colors. They remind me of the 80s. Congratulations Mary, another great race. I love reading about your races. I would love to be a runner someday once I lose a big chunk of this weight. I just hope my knees can take it. Good luck with the second interview. I'll be rooting for you. I teach grades 6 through 12. Just look them in the eye, smile, show no fear or hesitation and treat them with kindness and respect. The same goes for their parents. Keep in mind that the parents are entrusting you (meaning: the school) with the most precious thing they have, and their number one concern is to know their children are safe and happy and loved while at school. Congrats on the race and the interview. Congratulations on your successful race and good luck on your second interview! French is a difficult language to learn (I'm a native speaker! ), it's a great compliment to get! Good luck with the second interview!! And great job on the race! I was a couple pounds heavier on my first half than I was at a 25k and I definitely noticed a difference! Hang in there! Also, I LOVE this: When someone asks you how it's going, you reply "Forward!" I think you're just fantastic. Great job Mary! No races for me until a 5k on 9/8 and a 10k on 9/15. Then it's my first half on 10/7! EEK! I love the how we looked and how we felt comparison. I need to practice to not look how I feel. LOL. I think it is awesome that you run with Matt! I think of this everybody(you included) just start to running thing when I push the stroller of my grand baby on my walks and think of how the c25kers start out just doing a quick run for a moment...AND DID IT. I did not die. It felt awesome. Would you mind explaining to me about finding cost savings via Pinterest? Thank you! You sounds a helluva lot better than when you were out West. Love the going forward part. You are. Congrats on the race! Well done to the both of you on completing the race in tough conditions. The medal looks awesome!